Superior faux leather surface is waterproof and easy to clean. Stains can be removed with a quick wipe; chic and easily compliments your other furniture. 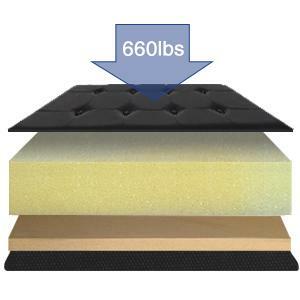 Solid MDF board holds up to 660 lbs (static load capacity); high resilience sponge brings you extra comfort. Easy to fold away and set up, quickly fold it down to its flat shape for space-saving storage when not in use. Absolutely wonderful, i purchased two for my dining room to add the look of a built in seating area. Very satisfied with product and to have extra storage when i need is great!!! I love this! It took 2 seconds to put together and looks fantastic. I wanted something that I could store my son’s toys in and that he could practice pulling himself up to stand with that didn’t have sharp corners, and this is great! Extremely flimsy product. It may be useful if you’re just storing light items, but anything over 25 pounds or items like blankets will cause it to become misshapen . Seat became loose after I sat on it about the third time. Staples used to secure the pleather to the cardboard is popping through…potentially dangerous as it could cause puncture wounds to skin.. for $50 buck it could’ve been made sturdier, but then again, it’s $50 and made in China, so….Edit:: I was contacted by the customer service department and offered the option of a full refund or a replacement product. I opted for a replacement after careful review. I think this product would be useful for storage of light products like pillows, blankets etc. Despite being rated for over six hundred pounds, I don’t think it’s made for CONTINOUS or repetitive seating. In any event, their customer service response was EXCELLENT. I received the replacement item in a timely manner at no cost. Their follow up has been great. I’ll update in a few months on how well it stands up to constant use, as I’ll be using it in my bedroom as a seat when donning/doffing socks, shoes etc. Great quality, big enough, love the color. I have a queen size bed and use it as a storage chest. Good for extra storage and looks great. Easy assembly. I recommend buying from this vendor. It arrived quickly and in good condition. Maybe we just got a bad one, but this ottoman did not hold up very well at all. It’s claims to hold quite a bit of weight, but my grandma, who is approximately 170 lbs sat on it, and the supporting board completely cracked. Now you can’t sit on it at all. Maybe it’s one of those freak things where she sat on it just right, but I’m not impressed.I was pretty happy with it until that point. It looks nice and stores a lot. We never really sat on it, just used it to store blankets. I’m thinking it wouldn’t have made it this long if we had been using it for seating. Very disappointing.We tried to see if there was a way to fix it, but we’re afraid if we put in a new board it wouldn’t sit right on the frame anymore. Right now it just looks like sunken in garbage. I have 2 of these! Love them they are a good value and work great. I store all kinds of things in them in my entry hall and living room. They look nice and are sturdy enough to sit on and put shoes on. One is pictured in the after picture of the front hallway we were rearranging. I bought this Songmics 43.25 inch storage bench on a lightning deal to put into a guest room to hold winter blankets. The only problem is something that is not currently mentioned on the product page. 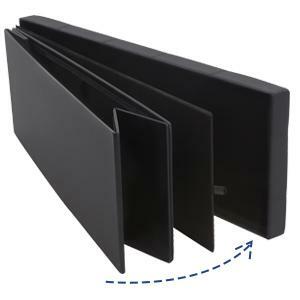 There is a center divider which the enclosed flyer states should be kept in place to “ensure stability and load capacity”.However, with the divider in place, it is not possible to put a large quilt or blanket in one side. The flyer also warns against over stuffing. The lid is a tight fit so not something that you would want to open and close on a regular basis.On the plus side, this bench looks attractive and took less than 3 minutes to unwrap and assemble. I wanted something at the foot of my bed that my elderly cat could use as a step; I have seen similar benches at Home Goods for $129 but I really didn’t like them. I did not expect to find a functional bench, that looks this good (not cheap at all) and has a modern flair. During the evening I store the decorative pillows from my bed in the bench. Assembly is hardly required, all you have to do is erect the collapsed box and put the cover on it. This was one of my smartest/favorite purchases! I really love this ottoman! Looks great in my foyer under my entry table. Already ordered another one for my Loft!